Featuring an indoor pool and hot tub this Madison South Dakota hotel is just 4 minutesâ?? drive from the Dakota State University campus. 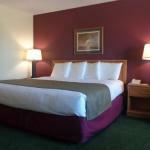 Free Wi-Fi and a flat-screen cable TV are included in every room. Featuring a bath or shower private bathrooms at AmericInn of Madison also come with a hairdryer and free toiletries. Extras include linen and ironing facilities. A daily hot breakfast with waffles eggs fresh fruit and more is served at this property. A 24-hour front desk is offered at Madison AmericInn. Other facilities offered include a vending machine. The property offers free parking. The Royal River Casino can be reached in 30 minutesâ?? drive. Joe Foss Field Airport is 54 km away.